Carley Roney joins Mallory in the MILK Studio. Carley is an entrepreneur and co-founder of The Knot, NYC's most successful early Internet company. She led The Knot from its early days as a wedding website to a multi-platform, multi-brand billion dollar company called XO Group. Outside of XO, Carley has focused her expertise in branding, content, and community building to support female-founded start-ups and progressive causes. Carley sits on the Board of Directors of fashion disruptor Rent The Runway, as well as non-profits Power of Two, Project Entrepreneur, and Brooklyn Community Foundation. She is a huge fan and advisor to female-led political community organizing start-ups Motivote and Sister District. 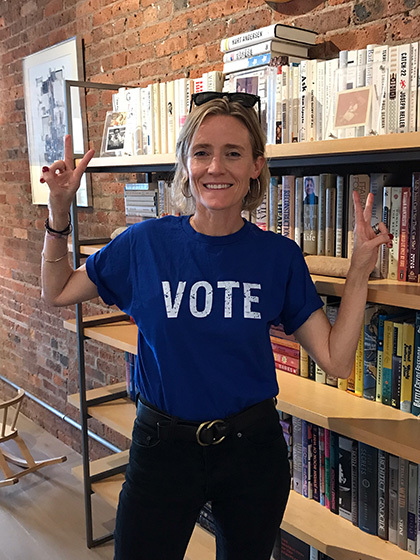 She lives in Brooklyn with her family and wants you to VOTE. Author Nina Lorez Collins joins Mallory in the MILK Studio. Nina is the author of "What Would Virginia Woolf Do: And Other Questions I Ask Myself as I Attempt to Age Without Apology." In her forties, Nina found herself awash in a sea of hormones. As symptoms of perimenopause set in, she began to fear losing her health, looks, sexuality and sense of humor all at once. Craving a place to discuss her questions and concerns, and finding none, Nina started a Facebook Group with the ironic title “What Would Virginia Woolf Do?” and that forum has grown exponentially into a place where women – with strong opinions and humor – share their private selves with bravery and most of all, with truth. WWVWD has morphed into an on and offline community, and into Nina’s funny and informative book. 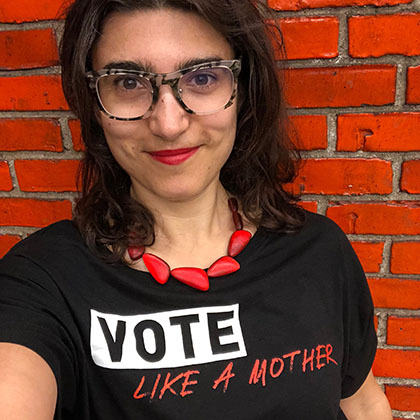 Sara Berliner is the founder of “Vote Like A Mother,” an organization that sells ethically sustainable merch with a wink, benefits mom run organizations, and acts as a filter for activism. Sara is also a children’s media executive, content curator, activist, and mom. Her career has been focused on storytelling across platforms and genres, launched from a Harvard degree in Folklore & Mythology, with criss-crossing paths through puppet theater, documentary film, the music industry, festival production and live events, children's book publishing and TV animation, and digital apps. Sara has told stories with collaborators like Todd Oldham, Julianne Moore, Sesame Street, Warner Bros., the Harry Potter film team, Disney, DreamWorks, Mattel, Highlights for Children, Scholastic, National Geographic, Penguin Random House, and Nickelodeon. Kimberly Peeler-Allen has been working at the intersection of race, gender and politics for almost 20 years, and she joins Mallory in the MILK studio. Kimberly is the Co-founder of Higher Heights, a national organization building the political power and leadership of Black women from the voting booth to elected office. A highly skilled political fundraiser and event planner, Kimberly ran her firm Peeler-Allen Consulting, LLC from 2003 to 2014, the only African American full-time fundraising consulting firm in New York State. Prior to that, she served as the deputy finance director for the 2002 gubernatorial campaign of H. Carl McCall. In 2014, Kimberly served as finance director for Letitia James’ successful bid to become Public Advocate of the City of New York and the first African American woman elected citywide in New York’s history. In 2018, Kimberly was selected as one of the Roddenberry Fellowship's 20 established and emerging activists to devote an entire year to projects that will make the U.S. more inclusive and equitable through their inaugural cohort. She runs Higher Heights with co-founder Glynda Carr, and runs her family with the help of her entrepreneur husband. Check out at www.higherheights.com for more information. This moment is a turning point for normalizing cannabis, and Alison Gordon is in the MILK Studio with Mallory to tell us why. Alison is the CEO of 48North Cannabis Co., a medical cannabis company based in Toronto. Named one of Canada’s Top 10 Marketers by Marketing Magazine, Alison has been celebrated for her unique ability to shift public opinion and consumer behavior in the right direction. As a co-founder and EVP at Rethink Breast Cancer for 13 years prior to joining the medical marijuana industry, Alison is credited with growing a new generation of young breast cancer supporters -- a previously untapped demographic compelled by her ground-breaking communication and branding expertise. Alison’s extensive work with patients, physicians and government, coupled with her entrepreneurial approach and marketing experience, has uniquely positioned her in the marijuana industry. Alison lives in Toronto with her family. Follow her @cannabisculturist on Instagram. Jennifer Steinman Sternin is an award-winning filmmaker with over 20 years of experience in television and film, and she joins Mallory in the MILK Studio. Jennifer talks about trusting the creative process to do its magic, growing up with strong female entrepreneurial artists as role models, becoming a single mother by choice, and how that decision changed her life and her work. She has a beautiful story about finding love at the perfect time, and how hitting milestones out of order has made perfect sense in her life. Jennifer is currently working on a film with percussionist Sheila E., and another project with Ilhan Omar, the first Somali American Muslim woman to be elected to a state legislature in Minnesota. She lives in the Bay Area with her family. Check her out at JenniferSteinman.com.